NEW YORK (CNNMoney) -- The U.S. Department of Energy said Thursday it will release 30 million barrels of oil from the Strategic Petroleum Reserve to alleviate Libyan supply disruptions -- driving already sinking prices lower. The release, which will be done over 30 days, represents half of a 60 million barrel supply hike announced by the International Energy Agency, which includes the United States as one of its 28 member nations. The world consumes 87.5 million barrels of oil a day. Of that total, the United States consumes about 19 million barrels per day, according to Tom Kloza, chief oil analyst at the Oil Price Information Service. The United States produces about 9.8 million barrels so it winds up importing about half of what it produces. The Energy Department said the reserve is at a "historically high level" of 727 million barrels. "We are taking this action in response to the ongoing loss of crude oil due to supply disruptions in Libya and other countries and their impact on the global economic recovery," said Energy Secretary Steven Chu. "As we move forward, we will continue to monitor the situation and stand ready to take additional steps if necessary." Libya is still locked in civil war, as rebels, aided by NATO airstrikes, try to unseat Moammar Gadhafi. 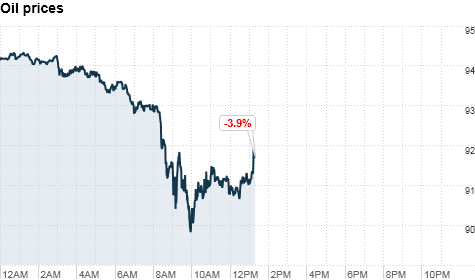 Oil prices, which were already sliding Thursday, fell even further after the announcement. "Oil prices are getting assaulted on two fronts today," said Kloza. In fact, oil and gas prices have been falling for the past several months. The price of a gallon of gas nearly broke $4 in May. Gas prices were selling at $3.61 a gallon Wednesday, according to motorist group AAA. Most experts attribute the price declines to expectations of weaker demand as the economic recovery continues to slow. On Wednesday, Federal Reserve Chairman Ben Bernanke gave a grim assessment. Oil prices plunged $4.39, or more than 4%, to $91.02 per barrel and a four month low after the news about the supply increase. At one point, they plummeted more than 5% to less than $90 per barrel for the first time since Feb. 22. "There is plenty of supply," Kilduff Group partner Mike Fitzpatrick told CNNMoney. "They want to push prices down to help the U.S. economy. Saudi Arabia called for this at the last OPEC meeting." The price of Brent crude -- the European benchmark -- declined by nearly 5%, with prices sliding $5.59 per barrel to $108.62.